A power struggle begins in a civilization dependant on an ancient technology, the blastia, and the Empire that controls it. The fates of two friends traveling separate paths intertwine in an epic adventure that threatens the existence of all. 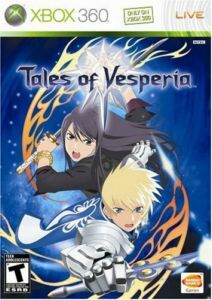 Tales of Vesperia marks the first Tales RPG release in HD with detail and graphics never before seen in the series. Now, real-time battles are more exciting than ever with over limits, the ability to unleash fatal strikes, combinations and burst artes. The next evolution of the revered role-playing series comes to the Xbox 360.